Hello good morning everyone !! I'm an early bird today, I only slept about 1 1/2 hrs. last night bec. i am not comfortable sleeping here at my shop.. Yay I'll be sleepy in the afternoon for sure. Anyway, Arrghhh, i'm already hating my typo errors....My Bes RACEl have already noticed it so much and she already brought it to my attention. Actually sometimes i just type and type and type w/o reading what i have written. Actually, the keys of my HP keyboard is the culprit, i need to press them hard these days and i guess i need to clean it throughly one time. I don't want to replace it yet bec. it is the original HP keyboard that matches my HP pavilion. 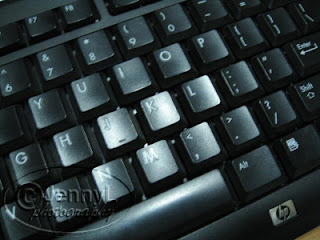 When the time comes when i can't type anymore then i will replace it already. At this point i just need to press my fingers a bit hard hahaha. Sorry for my typos..